A short but sweet video on this Good Friday. I’ll be awol through the weekend – see you Monday…happy Easter! Stunning! Your journey with watercolor has been inspiring to follow. Thanks for sharing!! Absolutely Easter Sunrise!!! An amazing video (wonder if I could paint as well with that inspiring music?!?) Thanks so much for the wonderful video. Mesmerizing!! He IS risen!!! Worshipful! On this Good Friday it’s good to remember that Easter morning is coming. He is risen! Breathtaking! The background music was perfect for the dramatic colors in the sky! Absolutely stunning. I love it. I have never been so much in awe of watching a video. A stunner as always. 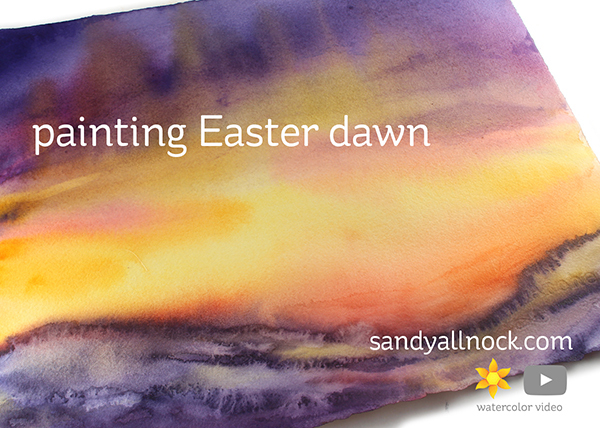 Have a wonderful Easter Sandy! Wow! Didn’t realize how I missed these type of videos. Watching the magic of what you come up with is amazing. Bring back Magical Mondays (i think that is what they were called) please. Something relaxing about the once a week video with no chat, but only once a week since I like the chatter as well. “Amazing” doesn’t begin to cover it! So cool to see the “artist and paper crafter” being a total artist!!! Thanks for letting us watch.